Architella shades are available for every window application. Use them in skylights and specialty shaped windows for light control where you need it most. Pair Architella shades with draperies or use the stylish top-down-bottom-up system for a truly unique look. At Windows & More in Osage Beach, we can help you find the perfect balance of style and functionality with your Architella honeycomb shades. A latest version of Architella honeycomb shades feature the revolutionary IllumiCell™ design. IllumiCell is a clear inner cell within the shade that offers greater light transmission with the same energy savings as a fabric inner cell. IllumiCell increases energy-efficiency while allowing more light and texture to come through the cellular shade. This innovative design combines a high quality privacy shade with superior light filtration. Duette Architella honeycomb shades take nature’s most perfect shape, the honeycomb, and double it to create a amazingly fashionable and energy-efficient shade. This window treatment uses three distinct air pockets to trap cold air in the winter and heat from the sun in the summer to you pay less on your energy bill. Comes in 88 material and color combinations. Features inner cells that support the weight of the shade so outer cells stay crisp and never flatten. 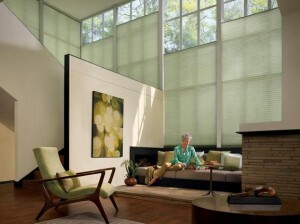 Available in a variety of light control and privacy options including semi-opaque and opaque fabrics. Accommodates a variety of lifting systems, including motorized and cordless operation. Design options include the very popular Top-Down/Bottom-Up style. Anti-static and dust resistant features make these shades easy to care for. 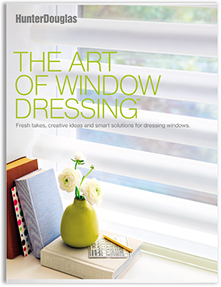 Includes Lifetime Guarantee, as with all Hunter Douglas window fashions. The Window Covering Safety Council recommends using cordless window treatments in homes with small children. Architella shades are available with the Literise operating system that eliminate cords and is simple to use. Push the bottom rail of the shade up by hand or pull it down to the desired location. With LiteRise, you have no dangling cords or cord loops. A variety of motorization options are also available for even greater operating convenience.